highlighting issues for which we have advocated in our community. 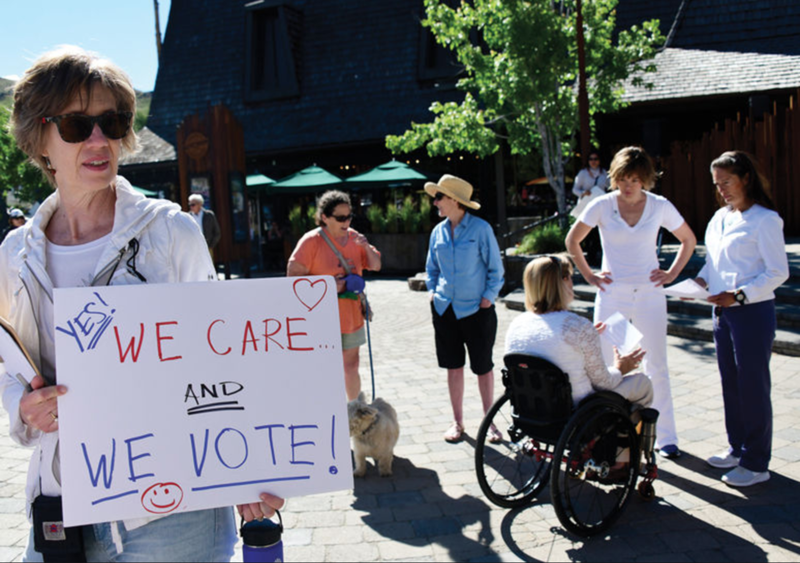 Participants in Saturday’s rally held signs and marched through downtown Ketchum. In the background, legislative candidate Muffy Davis speaks to Senate Minority Leader Michelle Stennett, D-Ketchum, right, and rally organizer Bena Larkey, left. Photos showing immigrant children separated from their parents at the U.S. border have sparked a nationwide backlash and intense criticism of President Donald Trump’s immigration policies. At a rally in Town Square in Ketchum on Saturday morning, Wood River Valley residents Marsha Takahashi Edwards and Rod Tatsuno said those photos have a personal resonance. Amid a shifting legal and political backdrop, the Blaine County Sheriff’s Office has stood by a longstanding policy of cooperating with Immigration and Customs Enforcement to detain suspects beyond their scheduled releases upon the agency’s request. Questioned by the Idaho Mountain Express about why he continues the policy, that was as much justification as Sheriff Steve Harkins would provide. Emerson Edenilson Flores-Minco had a choice: He could participate in the notoriously violent MS-13 gang or flee El Salvador. Two years ago, the 16-year-old chose to flee, eventually settling in Hailey with his father, a longtime Blaine County resident. Two years later, Flores-Minco was on a soccer field, overcome by emotion, embracing his father and surrounded by the ecstatic team that had become his family. The Wood River High School varsity boys soccer team had won the 2017 state championship in Flores-Minco’s first season on the team. Adding to the euphoria, the players subsequently voted Flores-Minco as one of two co-MVPs for the game. The coach, Luis Monjaras, said Flores-Minco had a “bright future in soccer here,” but a few months later, the 18-year-old high school junior was sitting in Blaine County jail. The charge that landed him there was a first-time DUI, a misdemeanor that was later amended to inattentive or careless driving, a lesser misdemeanor. He was ultimately sentenced to time served—two months, for an offense that typically carries no more than a few nights in jail. On a recent Friday afternoon, a woman overheard Sarah Sentilles and Patty Tobin, co-founders of the Immigration Alliance of Idaho, talking over tea in Hailey. A year ago, it was a different sort of dialogue that sparked things to begin with, according to Tobin. Then, Tobin, a Ketchum resident, met Sentilles during an event at the Community Campus in Hailey. And again, at a local meeting of Indivisible, a national progressive activism organization. Together, backed by a core set of members, they gave their new group its name, and established its purpose: The Immigration Alliance of Idaho, a Blaine County-based education, outreach and aid group aimed at supporting immigrants in the Wood River Valley. On a recent Saturday in Hailey, a young girl sat before a stack of felt-tip markers in the corner of a well-lit room. All pink and pigtails, she picked one up and wrote “My Family” at the top of a plain white page. Then, she filled it with neon stars. Her parents sat 15 feet away, waiting in line to start a process that they hope, months from now, will see them standing before a different banner, filled with different stars—red, white and blue. This was Citizenship Day, one of 10 workshops designed to help immigrants across the state navigate the fraught landscape and bureaucratic hurdles along the road to naturalization. But for the people filling the seats Saturday, those short-term delays are slight. Sign up with your email address to receive news and updates about what we’re doing and how you can help.